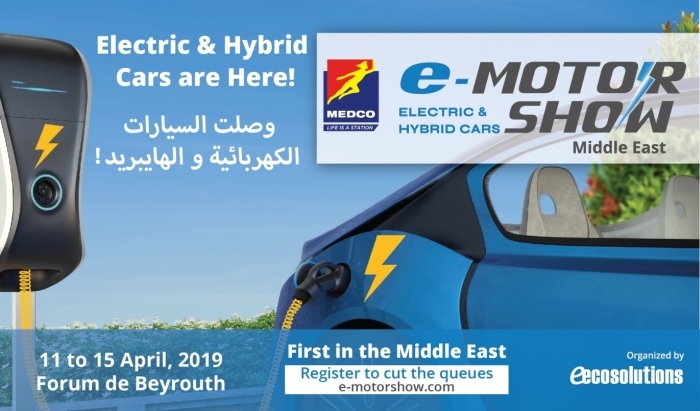 Beirut will host the First e-MotorShow® in the Middle East for Electric & Hybrid Cars from 11 to 15 April 2019 at the Forum De Beyrouth. This was announced on Wednesday 27 March 2019 during a press conference at the Ministry of Environment. The e-MotorShow® Middle East is organized by e-EcoSolutions Sustainability Firm, under the patronage of H.E. the Minister of Environment Mr. Fady Jraissati, in collaboration with the AIA (Association des Importateurs d' Automobiles au Liban), and with the Title sponsorship of Medco. A Show of Electric & Hybrid Cars by the different leading car brands (including Audi, BMW, BYD, Chevrolet, GAC, Hyundai, Jaguar, Mercedes Benz, Porsche, Renault, Volvo). An e-Mobility Tech-Talks Platform featuring local and international speakers and panel sessions on various e-mobility topics. An e-Circuit for Test Drives Indoor and Outdoor, allowing all visitors to Test-drive “noise-free” and “emissions-free” electrified vehicles. The press conference featured the words of H.E. the Minister of Environment Mr. Fady Jraissati, Mr. Gilbert Tegho, CEO of e-EcoSolutions and Mrs. Michèle Chammas Garzouzi, Group Marketing and Retail Sales Director of MEDCO, and was attended by different media and event supporters. “With the growing environmental pollution and the trend towards alternative energies, it is important to develop the automotive industry with the aim of reducing the resulting carbon impact. This qualitative revolution in the transport sector takes into account the environmental standards that have become mandatory in many countries that are seeking a better future. Gilbert also thanked H.E. the Minister of Environment Mr. Fady Jraissati for presenting his patronage, as well as the e-MotorShow®sponsors: Title Sponsor MEDCO and Silver Sponsors Commercial Insurance, Talaya and Uber. He also expressed his great appreciation for all event Supporters and regional and local Media Partners. At the end of the Press Conference, e-EcoSolutions has invited all visitors interested in attending the e-MotorShow® to register online in order to cut the queues at the doors, and informed them that they can also benefit from 2 free Uber rides to and from the e-MotorShow® (up to 5$ each) using the Promocode: emotorshowlb . The e-MotorShow® will be also promoting sustainability through different measures taken at the event such as promoting carpooling and Uber rides to reduce carbon emissions of visitors, offering free glass water bottles for refilling by Talaya, and special edible and biodegradable plates as a way to fight single-use plastic waste, protecting the venue environment using Integrated Pest Management, and more Green measures.